Cumberland Point From Glasgow, Kentucky. This Cumberland point is referred to as the “Grievo Cumberland.” It was recently rediscovered in an old safe in New Jersey that hadn’t been opened for sixty years. This is an excellent example of a very rare eastern fluted point type. Its most interesting feature is the sharpened edges near the point that were also serrated, an indication that it may also have been used as a knife. It’s made of either St. Genevieve or Fort Payne chert and measures 4 ¾ inches (12 cm) long, 1 3/16 inches (3 cm) wide and 5/16 inch (8.4 mm) thick. Cumberland points are diagnostic of the Paleo-Indian period. 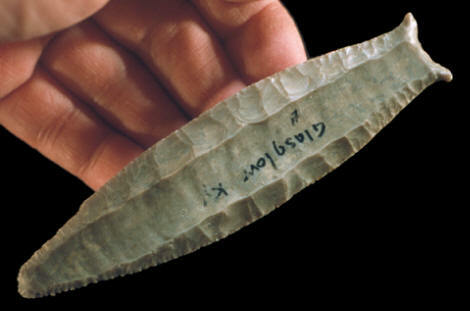 The only carbon date for a Cumberland point comes from the Dutchess Quarry Cave #1 site in New York. A carbon date taken from a caribou bone produced a date of 10,580 B.C. + 370. Cumberland points have been described as being diagnostic of the Parkhill complex in the Great Lakes area. The Parkhill complex is known for Barnes points, which have a different shape than Cumberland points. Cumberland points are found in Kentucky, Tennessee, Alabama and other states in the southeast.